A broken window regulator can be a frustrating problem for drivers, but it is one that needs to be fixed immediately and by a team of experts. At Superior Mobile Auto Glass our mobile technicians will be with you quickly and get the repair job done in no time. The regulator is the device that controls your automatic window. It can wear out from constant use, or it can be damaged if you have a bump or minor accident. If it is not fixed right away it leaves your vehicle unprotected from the elements, and vulnerable to theft or vandalism. All of our mobile technicians carry top of the range window regulator repair kits and spare parts so we can get the problem sorted quickly and efficiently. It doesn’t matter what make or model of car you drive, we can sort any car window regulator problem. It is important to keep your power windows functioning properly for a variety of reasons. Your vehicle must always be kept safe and the mobile team at Superior Mobile Auto Glass is always on hand to respond to any regulator fixes that need to be carried out in the Las Vegas area. 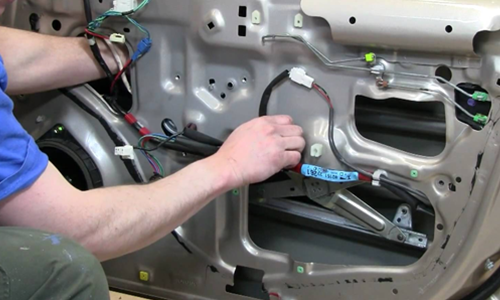 If the device is broken, you will need an electric window motor replacement. Our crews will remove and replace the faulty regulator, check the operation of the new regulator and motor, and make sure the window is going up and down freely and smoothly. If the window does not go up or down or has fallen into the door, then you need to call us on (702) 706-0716. Sometimes the window can be noisy during the operation process, or moves up and down at an angle, tell-tale signs that your window regulator needs to be replaced.